For much of the first half of the 20th century, the largest employer and largest property owner in Washington, D.C. —not called the United States government— was ... a brewery. But few D.C.-area 'craft' beer fans, today, know about this. That may soon change. Here's how a homebrewer, a Washington, D.C. brewery, and a museum have resurrected a long-lost beer. In 1872, a young German immigrant named Christian Heurich arrived in Washington, D.C. He would soon purchase the Schnell Brewery and Tavern, at 20th and M streets NW, a small, struggling brewery that had opened during the Civil War in 1862, and whose brewmaster at the time was an African-American. Heurich enlarged the operations and renamed the brewery eponymously. There was one structure on the grounds, however, that was not fire-resistant: the building that housed all of the brewing records was built of wood. In 1935, it burned to the ground, destroying an entire history of brewing recipes and procedures. The rest of the brewery would continue operations until it was finally closed in 1956, with an annual capacity of over 500,000 barrels. The Christian Heurich Brewery had been the nation's capital's largest brewery, and it would be its last brewery, for decades. In 1986, thirty-years later, Christian Heurich's grandson, Gary Heurich, a successful Washington, D.C. real estate businessperson, revived the beers, if not using historic materials, at least designing the beers in the style of the original beer. He arranged to have the F.X. Matt Brewing Company (now popularly known as Saranac) in Utica, New York, contract brew Old Heurich beer. The Maerzen, and the later, Foggy Bottom brands, were, for a time, the de facto hometown D.C. beers. In 2005, when professional baseball would return to Washington, D.C. after a thirty-one year hiatus, Olde Heurich had a prominent $750,000 concession on the main promenade of RFK Stadium. The venture, however, had been ahead of its time, and the following year, Gary Heurich ended its production. Homebrewer Mike Stein, whose master's thesis involved brewing history, had been searching the National Archives for clues about the original Heurich's beers. He discovered, not recipes, but actual receipts of Heurich brewery transactions. Using those —and indeed surviving recipes of other U.S. breweries of the time— he and fellow homebrewers —Joshua H. Hubner and Pete Jones— created a recipe, and home-brewed it. 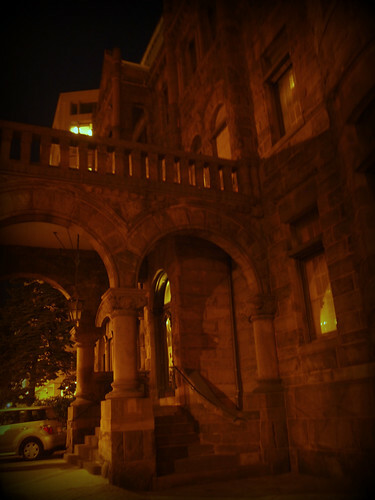 When the Christian Heurich Brewery closed, the family and operating board donated the extant Heurich family house, a Victorian-style mansion popularly known as the Brewmaster's Castle, at 22nd and M Streets NW, to the Historical Society of Washington, D.C.. Now a landmark on the National Register of Historic Places, the house was built in 1892 of poured concrete and reinforced steel, the city’s first fireproof house. In 2003, upkeep of the building was ceded to the non-profit Heurich House Museum,, which maintains it today. As kismet would have it, Stein was recreating Heurich's recipe, at the same time that Kim Bender, executive director of the Heurich House Museum, was looking for a brewing partner to recreate the beer of the namesake brewery. She and the Museum's board tasted his beer and enthusiastically approved. Local 'craft' brewery, DC Brau (itself the first production brewery in the city since Heurich's demise), scaled up the recipe, and brewed a small, one-off batch. 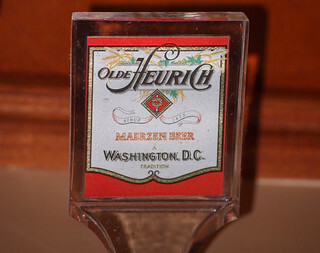 Heurich's Lager debuted during DC Beer Week of that year. Thursday night, 24 March 2016, liquid history repeated itself. DC Brau has again brewed a small, thirty-barrel batch of Heurich's Lager. It will be released tonight at the Heurich House at a special celebration and fundraiser for the museum. After that, cans and kegs of the beer will be distributed throughout the city, while, as they say, supplies last. What is the beer like? 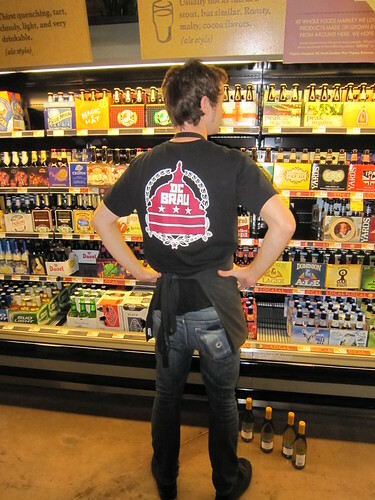 Jeff Hancock, DC Brau's brewmaster, filled me in on the details. For this iteration, he turned to research by the late Professor George Fix. To a grist of Czech pilsner malted barley, Hancock added American flaked maize and rice. He infused the wort with Czech Žatec hops (known, in German, as Saaz: hops that Stein had determined to be in the original recipe) in the kettle, achieving about 40 International Bittering Units (IBUs). He fermented the result with a Bavarian-sourced yeast, and lagered —that is, stored cold— the finished beer for three weeks. (Lager is the German word "to store." Extensive lagering is an essential process for producing a traditional lager.) The beer was partially carbonated, also in the German-style, by closing the tank when fermentation was nearly concluded, trapping residual yeast-produced carbon dioxide. To get to the desired level of bubbles, he topped off the beer with additional CO2. Hancock was enthusiastic about the results. The alcohol level is about 7% by-volume, he told me. The beer appears light gold in color, with a crackly white head of foam. Filtered, it has a brilliant see-through clarity, just as contemporary reports had acclaimed Heurich's Lager of half-a-century-ago to appear. The flavor is medium-bodied and malt-accented, with floral and spicy hop characters, and sweet grain aromas. The corn, Hancock pointed out, added a depth of flavor, something he had anticipated from his research. 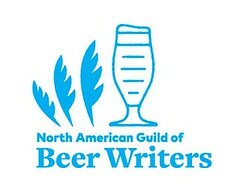 For many years 'craft' beer drinkers have spurned beer made with corn, perhaps spurred on by the [U.S.] Brewers Association, which defined 'craft' beer, in part, by the absence of "adjuncts" such as corn. This amounted to blaming the ingredient rather than its misuse by macro-industrial breweries. 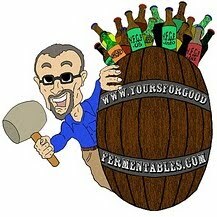 Should Belgian beers be damned for use of brewing sugars? Should German hefeweizens be eschewed for use of wheat over barley? Many would disagree. Likewise, praise the maize: it has been a traditional ingredient in American beers, ales and lagers. 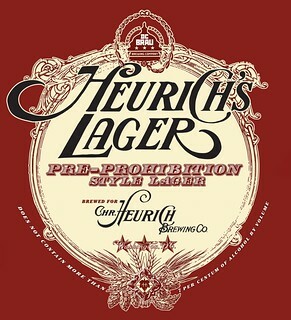 DC Brau has produced approximately 1,000 gallons of Heurich's Lager: half the run packaged in kegs, and the other half, about 150 cases, in 12-ounce aluminum cans. It'll be available at the DC Brau's tasting room, and in shops and pubs, but only in Washington, D.C. The label, based on a late 1930s design from the Heurich House archive, was created by artist Graham Jackson, who has designed other labels for DC Brau. It's not much. Will there be another batch of Heurich's Lager? Maybe. When the Christian Heurich Brewery ceased operations in 1956, its trademarks, through disuse, expired. Gary Heurich would trademark "Olde Heurich" and his own, "Foggy Bottom," but those rights have lapsed, as well. Today, the Heurich House has the trademarks to "Heurich's Lager," the "Christian Heurich Brewing Company," and "Senate Beer," another of the orignal brewery's brands. DC Brau paid Heurich House for one-time use of the rights to the first two, as a contribution, in kind, to the non-profit. Part of the difficulty that small 'craft' breweries encounter when producing lagers is the lagering itself. Storing beer for weeks or months requires tank space, a precious commodity. To that end, DC Brau is expanding. Founded five years ago (in fact, its first beers were released 15 April 2011), the brewery currently sells its beer in Washington, D.C. (of course), adjoining Virginia and Maryland, and New Jersey and Connecticut. Coming soon is a brewery expansion from 30,000 square feet to nearly 50,000, a doubling of its brew-length to sixty barrels, a new, state-of-the-art German-manufactured 4-vessel automated brewhouse, and a new canning line increasing packaging yield from the current 35 cans per minute to 250. "Yes," Hancock told me. "More lagering capacity could be in the cards." Prohibition came early to Washington, D.C.: it was established in the city, by Congress, in 1916, whereas, nationally, not until 1920. To his credit, Christian Heurich would survive that seventeen-year drought, and reestablish his brewery ... in his age 90s. In most other cities, Ms. Bender reminded me, a story like Heurich's would be remembered well, but in Washington, where history focuses on the federal side, there are large gaps in the narrative. The Heurich House is an intact Victorian-era house, the home of an important historical figure. The Heurich House Museum helps keep that story alive. A lot of people are getting over the idea that if the other person drinks an IPA, I should drink it as well. Pilsner will have a big renaissance, in my opinion. But drinking your well-made 'craft' lager ice-cold, like a macro-lager swill? No, not so much. 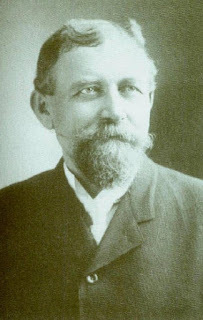 In his day, Brewmaster Heurich was known to warm his lager on a radiator to get it to that just right not-too-cold not-too-warm temperature. Just like a latter-day 'craft' IPA ... if not on a radiator. 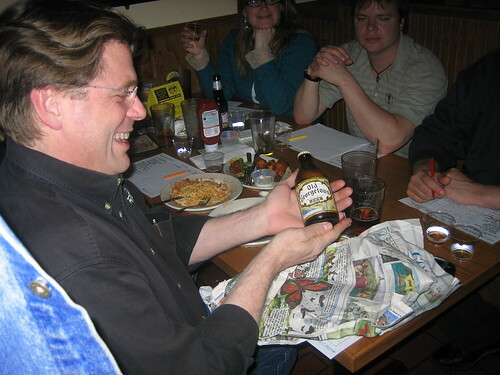 Hancock told me that 'craft' beer drinkers have been calling the brewery since news of Heurich's Lager was first reported. "We thought you were the first brewery in D.C.," they've told him, confused. The history of beer in Washington, D.C., the history of 'craft' beer, the history of American beer: it's something that goes way back, and it's something we would all be well served to learn, and celebrate. Thursday night, Heurich's Lager was re-released at the Heurich House, and, in Christian Heurich's honor, Ms. Bender promised that the Heurich House would "party like it's 1916." Even though DC Brau, in 2011, would become the first production brewery to operate in Washington, D.C. since Heurich's closure in 1956, Capitol (sp) City Brewing Company, a brewery-restaurant (or brewpub), would open in 1992, returning brewing to D.C. after an interruption of thirty-six years. There are now eleven breweries, production-only and brewpubs, in the city. Make a donation (tax deductable) to the Heurich House Museum: here. Kojo Nnamdi Show (WAMU-FM): Reviving Heurich: A Historic Brew Retakes D.C.
Barleycorn (1995): Cornflakes in Your Beer? Mike Stein at Lost Lagers. Personal communications with Kim Bender (Heurich House), Fritz Hahn (Washington Post), and Jeff Hancock (DC Brau: pronounced, "Dee Cee Brow," like "ow! ").